Sometimes an improperly functioning HVAC system can seem like a matter of luxury or mere convenience—you’re just a bit too warm in the summer, or the air is a bit too dry so your lips get chapped, or the air circulates in a way that doesn’t reach certain spots. But nobody can argue that a malfunctioning furnace in the winter months can quickly become a matter of grave importance if not taken seriously and resolved in due time. There’s a wide array of things that can go wrong with a furnace, from ignition control and pilot light problems, to a malfunctioning gas pressure regulator, to miscellaneous other mechanical issues. Any one of these has the potential to leave your home dangerously unheated until you get it fixed, and by the time you catch the issue and decide to address it, it may require costly repairs, if it’s worth repairing at all. And then there you are, blindsided by large unexpected expenses, and shivering in the meantime. Don’t let this happen to you. 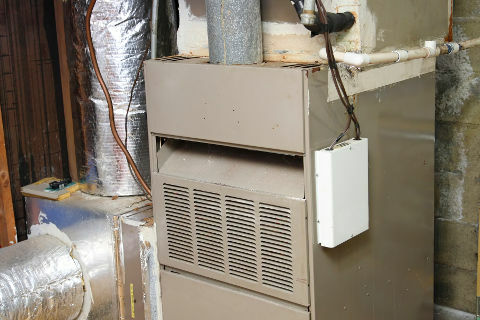 It’s always wise to get your old furnace looked at and either taken care of or replaced before it’s too late. But often this isn’t something to do yourself—performing these repairs without training can be dangerous and can void your warranty. This is work best left to professionals—and we’re exactly the professionals you want on the job. We’ve been providing top-quality furnace service in the Rockford, IL area since 1964. 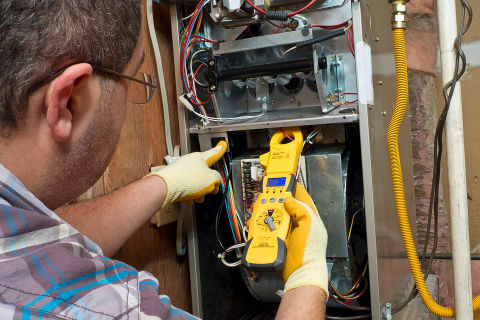 We service all brands of HVAC equipment and have the parts and knowledge to get you up and running again in no time, whether you need your furnace needs replacement or just a check-up. At Gough Heating & Air Conditioning, we believe in annual maintenance. Regular visits from a technician to clean up and check on your furnace will improve your system’s efficiency, extend the life of your equipment, prevent expensive and inconvenient emergency service visits, and provide you with peace of mind that your furnace is operating safely. Your annual cleaning and check-up visit can be scheduled at any point during the heating season, but we know that with everything else going on it can be easy to let it slip your mind. That’s why, for your convenience, we offer the opportunity for you to sign up to receive a postcard or email reminder in early fall every year, letting you know that it’s time to schedule a visit soon. Still, sometimes no matter how well you’ve cared for your old furnace, it’s time for it to go. Whether you’re replacing your furnace because your existing unit is beyond repair, or simply upgrading to a higher-efficiency model to decrease your utility bills, Gough has a solution to meet your needs. We offer a range of brands to choose from and can help you find the unit that’s the right fit for both your budget and your home’s unique requirements. Once you’ve selected your furnace, our crews will provide quick, stress-free installation while respecting your home and your schedule. Realizing that the need for furnace replacement can slam you with unexpected financial costs, and that a furnace is a serious long-term investment, we’ve even made financing options available for you to take advantage of and ease the burden of such a project. So don’t get left out in the cold—we encourage you to give us a call for a free estimate on a new furnace, or to talk to us about our maintenance services.